Here's a reflection shot, earlier than usual this week because, as previously established, I'm not going to get a Saturday. This is a street by the High Line reflected in the windows of a very large empty showroom, and what I like about this picture is that it's not always obvious what's inside and what's reflection. 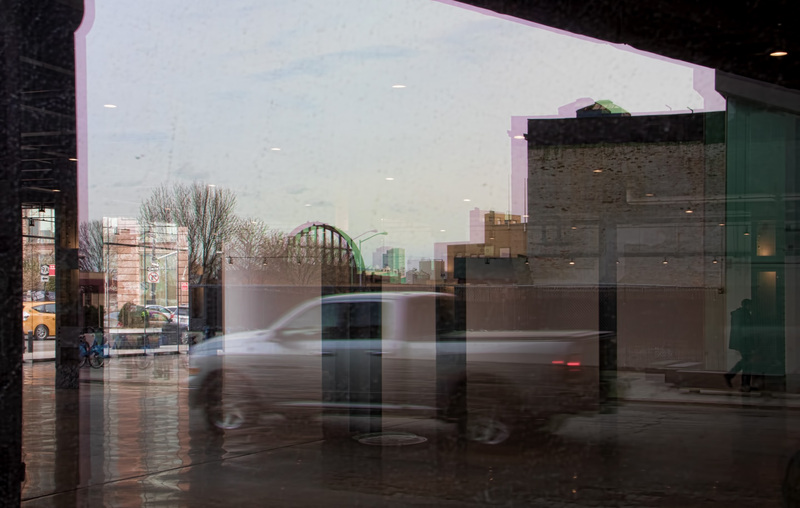 The truck, obviously is outside, but that figure on the right going through the door was actually inside the showroom. That bright green dot in the lower right-hand quadrant of this image is a comet with the not exactly mellifluous name of 252P/Linear. This photo was taken in Australia, shortly before the comet's closest approach to Earth (you can see the Southern Cross over on the right, four stars in the shape of a small kite partially overlapping the Milky Way.) 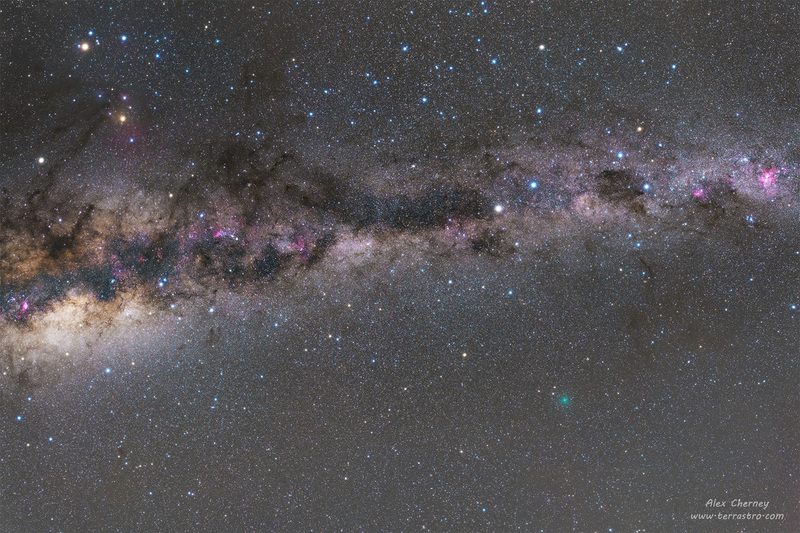 It's visible in the Northern Hemisphere now, but if you miss it it will be back in 2032. Starting next week, I'm sure I'll have lots of Tawny Frogmouths and Pied Currawongs and Noisy Friarbirds to post, but in the meantime, live from the less exotic spheres of Central Park, New York City, here's another common grackle, this one shimmering green for Easter. 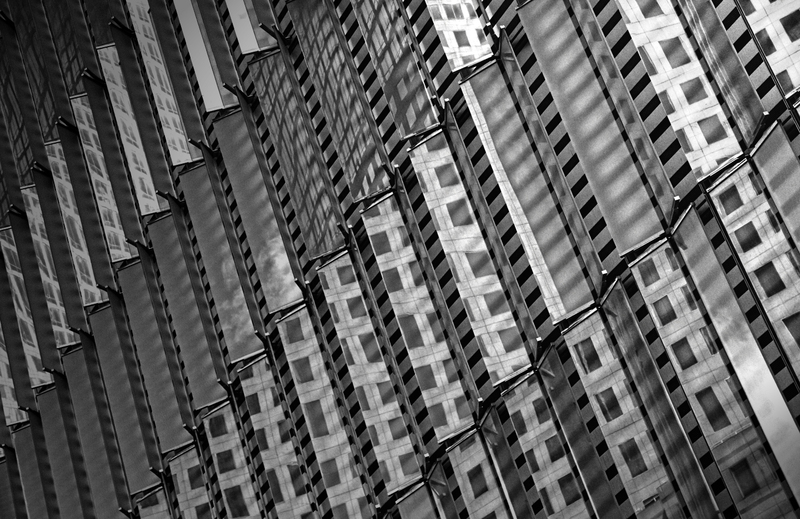 Details on the facade of One World Trade Center, dramatic in black and white. 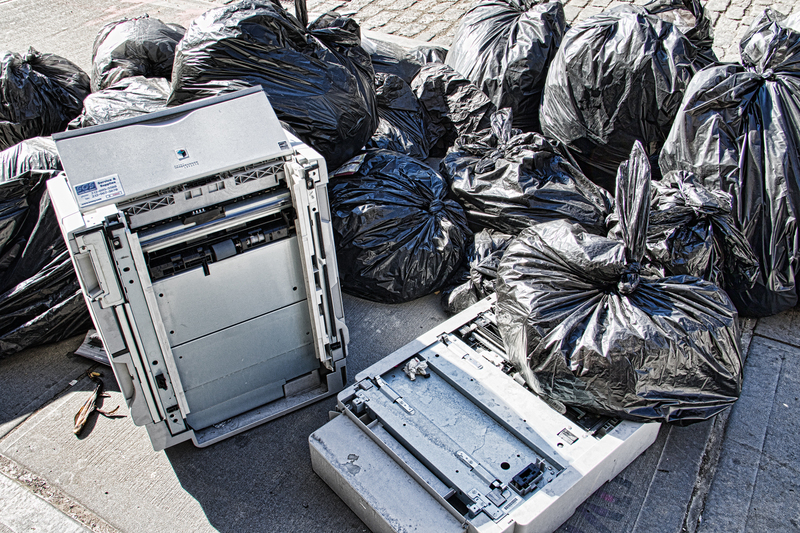 Two probably quite expensive, and presumably no longer functional, color printers, left out on the sidewalk with the rest of the trash. 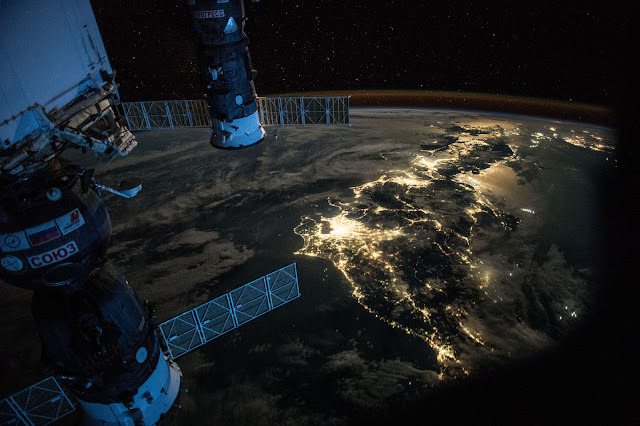 This gorgeous view of Japan was taken by Scott Kelly during his year on the International Space Station. Here's some urban poetry for the start of the week -- more pictures from the High Line last weekend. 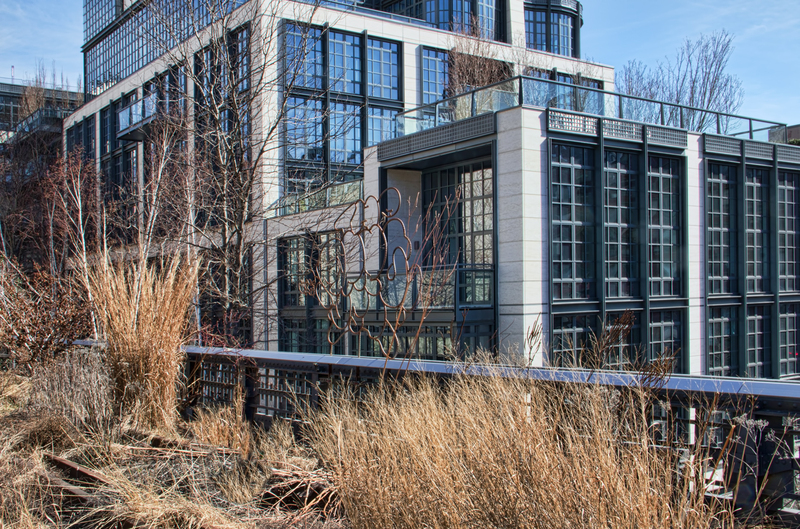 The High Line is an old set of elevated railway tracks that ran down the west side of Manhattan. They ran directly through the large industrial buildings there, so freight could be easily unloaded. The railroads and the factories left, and the train tracks remained, running overhead in the middle of the block in Chelsea, rusting and long abandoned. They were frequently scheduled for demolition, but there was always something else more urgent to spend the money on. 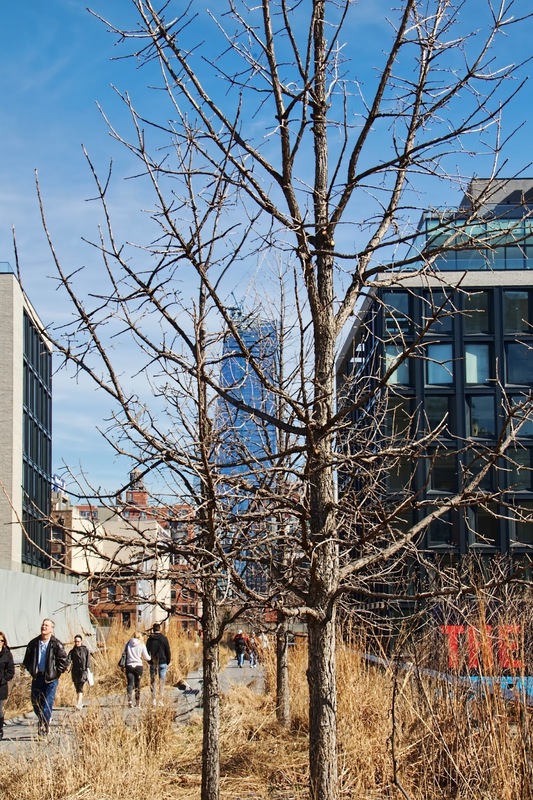 Several years ago someone had the brilliant idea to turn it into a park. The train tracks are still there, but there are trees and wild grasses and benches to sit on, and it's a very pleasant place to stroll on a sunny morning. 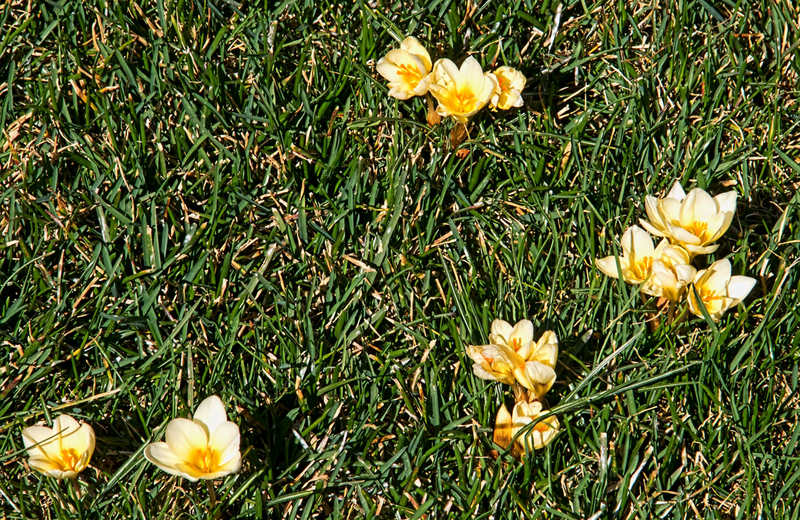 In honor of the occasion, here are some crocuses on the High Line last weekend. 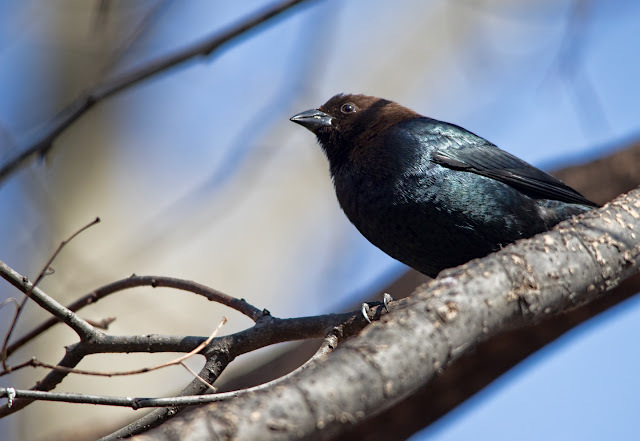 A brown-headed cowbird in Central Park. The reflection in this shot is in the window over to the right. 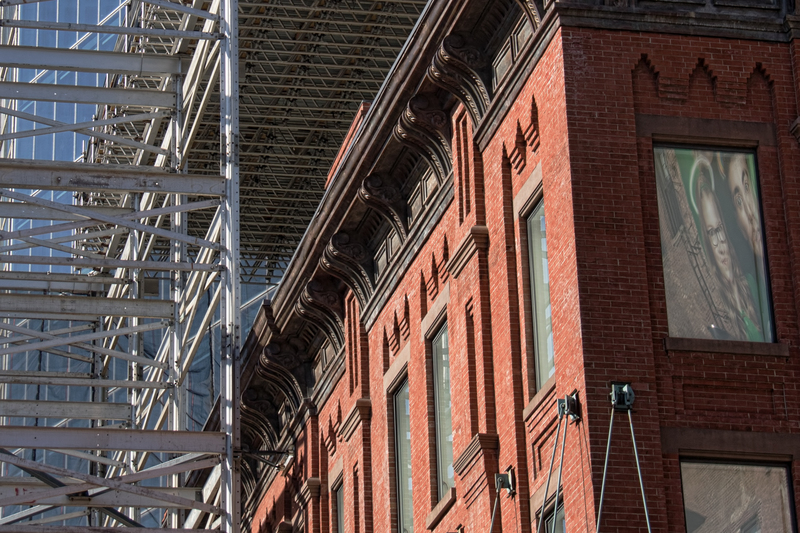 I like how you don't notice it at first, lost in the busyness of New York old (brick), new (glass), and even newer (scaffolding). Another trip to the Apple store this morning and I am now in possession of the missing adapter. I said to someone that two weeks from today I'll be en route to Australia, but that's not exactly right. Thanks to the dark magic of the international date line, Saturday April 2 won't exist as far as I'm concerned. I'll get on a plane Friday night, and when I get off in Melbourne several hours later it will be Sunday morning; the clock will flip from 11:59 pm Friday to 12:00 am Sunday without pausing for even a second on poor Saturday. I've gone to the Far East many times for work so this isn't my first lost day, but I completely understand why the early urban myth that there were riots in 1752 when Britain switched from the Julian to the Gregorian calendar and lost eleven days seemed as though it should have been true. (Though if I were going to riot about changes to the calendar I would have been far more upset by the fact that as part of the same shift 1751 was only 282 days long.) Calendars and watches make a comforting grid to rein in some of the huge messy sprawl of human life. No matter how much of a mess I make of Friday, when I wake up tomorrow it will be Saturday, and that's something I can count on. Unless, of course, I'm on my way to Australia. Apologies for the grainy, badly exposed shot, but this was the best I could do through a window on a gray morning. 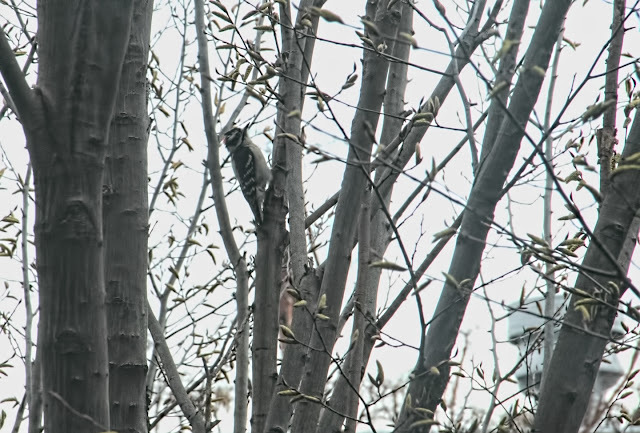 That's a red-bellied woodpecker in my backyard, trying in vain to get something interesting from the spindly trunks back there. While I do see interesting birds from my window occasionally, this is the first woodpecker. There was a female cardinal as well, but she was sitting behind too many branches to be photographed. 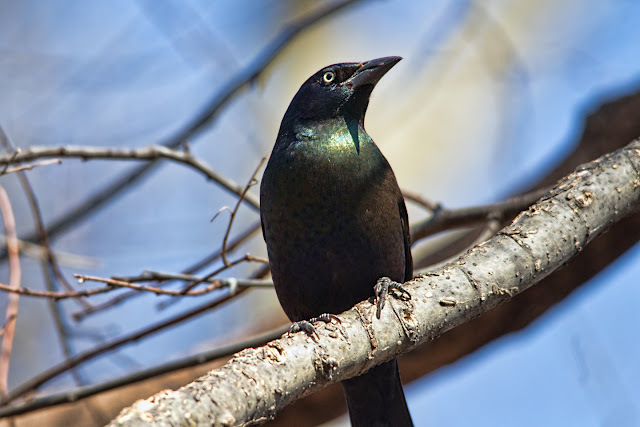 She had a long strip of paper in her beak, probably for nest-building, but the effect was extremely festive, like a one bird ticker tape parade. 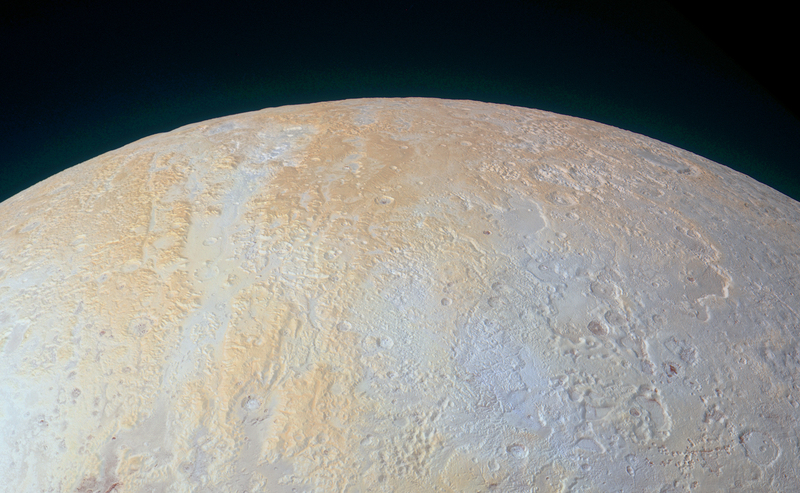 That enormous dark spot on the familiar face of our planet (hello, Australia!) is the shadow of the moon. 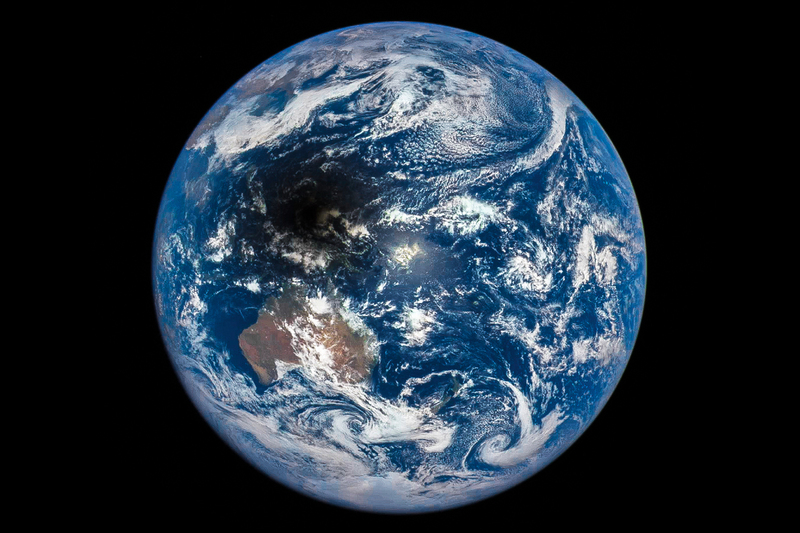 This image was taken from the Deep Space Climate Observatory during the total eclipse on March 9. For those like me who have always wanted to see a solar eclipse, in August of next year a total eclipse will be visible across much of the United States. Not New York, sadly, but I will definitely be going somewhere (Oregon or Wyoming most likely) where it is. 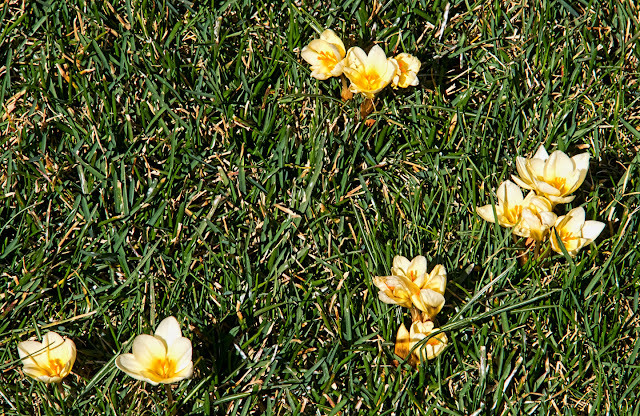 They definitely got the memo -- spring is here. Time to turn bright white and yellow and start hunting for a mate. 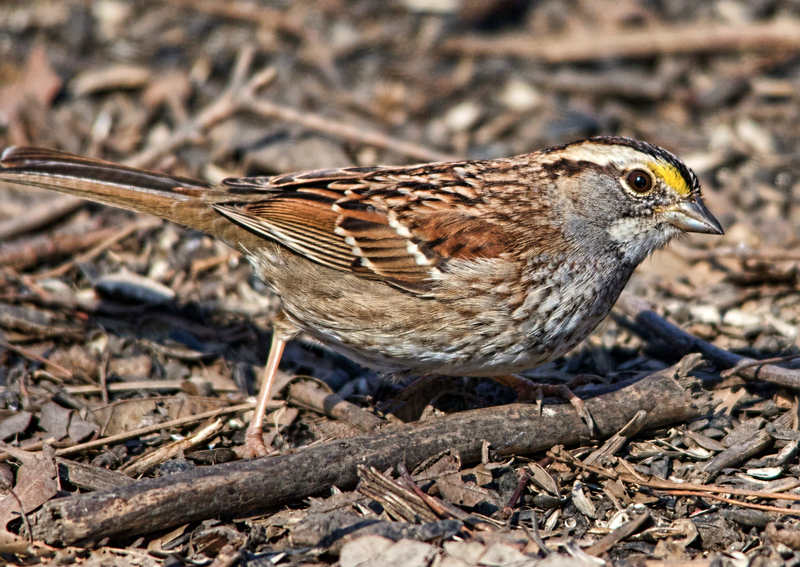 This is a white-throated sparrow, for those who care about these things. 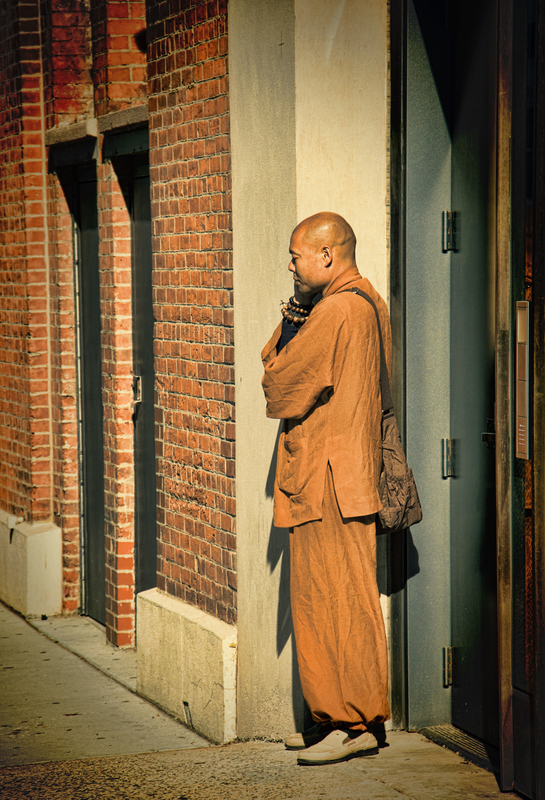 I like the combination of the retro filter with the very modern subject of the fake monk wearing Crocs and talking on his cell phone. 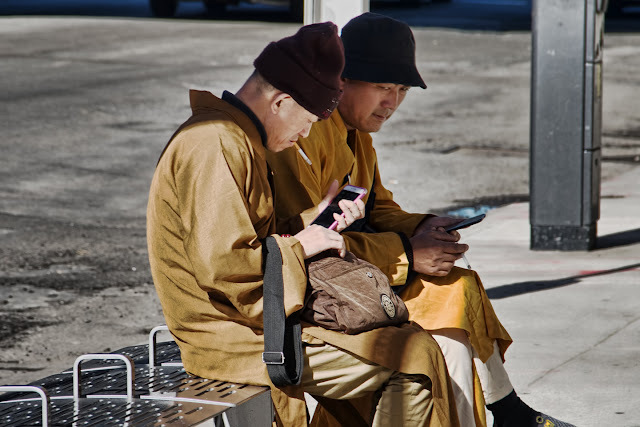 In case the cigarettes and smartphones aren't enough of a clue, these aren't actually Buddhist monks; they're part of a new army of panhandlers that's infested popular tourist areas -- men, and some women, who wear religious robes and ask for money to build a temple in Taiwan. These two were taking a break from harassing strollers on the High Line. I was downtown early this morning to visit my friends at the Apple store -- they're recalling travel adapter kits because of danger of electric shock. Since I'll be needing one of the potentially deadly adapters shortly, I signed up for an appointment as instructed the day I got the notice. And of course, it turned out to be not that simple. I wouldn't presume to tell Apple how to conduct their business, but if it were my company, and I were requesting that customers who had purchased a particular product return them to my stores -- and not just wander by whenever it was convenient for them but schedule an appointment in advance -- I would probably make sure that I had the replacements in stock. But that's just me. Needless to say that wasn't the case, and the adapter that happened to be out of stock was the one I'm most anxious to have -- the one for Australia. It's on order, and I should have it in plenty of time, but still. It was only by an extreme exercise of will power that I didn't head immediately to the nearby Sarabeth's bakery and soothe my frustrations with carbohydrates. 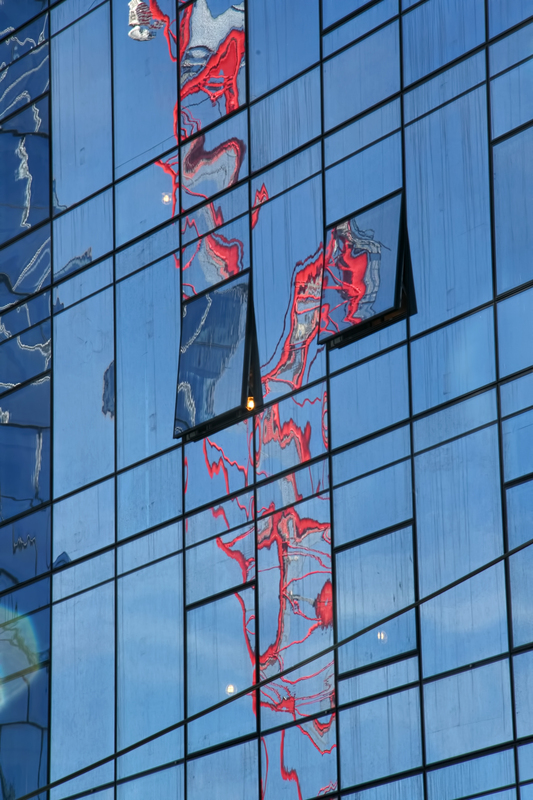 A red construction crane is reflected into an abstract spill of color by a glass facade in Manhattan. 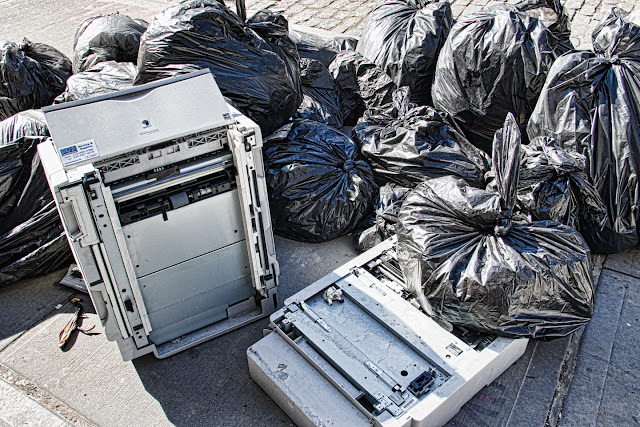 It's obvious to anyone who reads more than one entry on this blog between the months of December and March that winter makes me exceedingly grumpy. 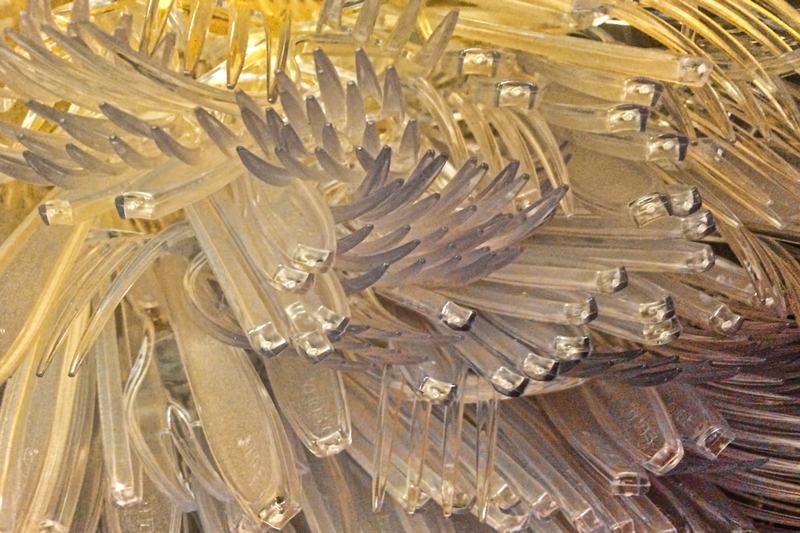 That doesn't mean that I'm comfortable with it vanishing so quickly and completely. It was so warm yesterday I didn't wear a coat to work, and I had to turn on a fan to sleep last night because the room was so hot and stuffy. It is still March. It is still, officially at any rate, winter. I'm still carrying a scarf and gloves everywhere in case I need them. After 30+ years on the East Coast, I've grown accustomed to having seasons and I want them back! Here's another view of my favorite not-quite-a-planet Pluto, taken by the New Horizons spacecraft last year. 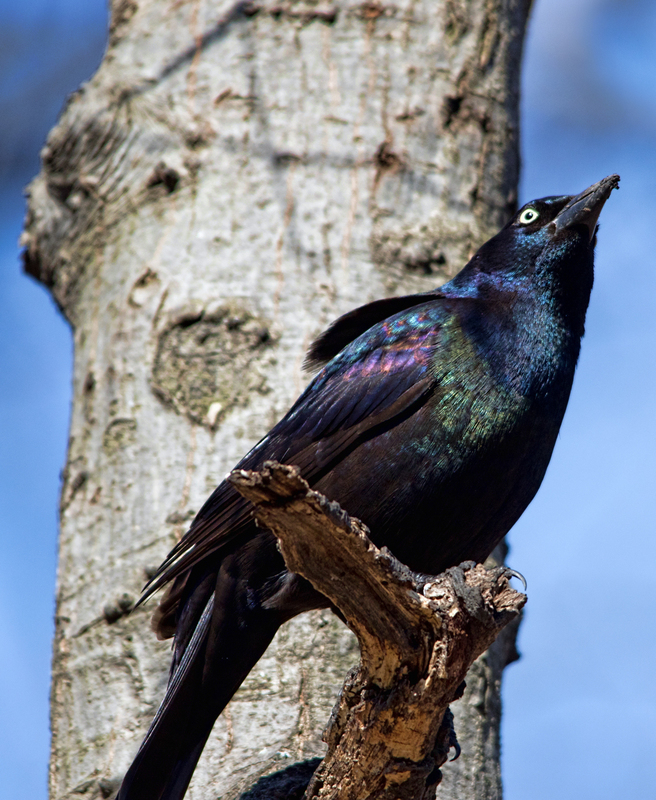 The baleful eye and giddy iridescence of the common grackle, in Central Park today. 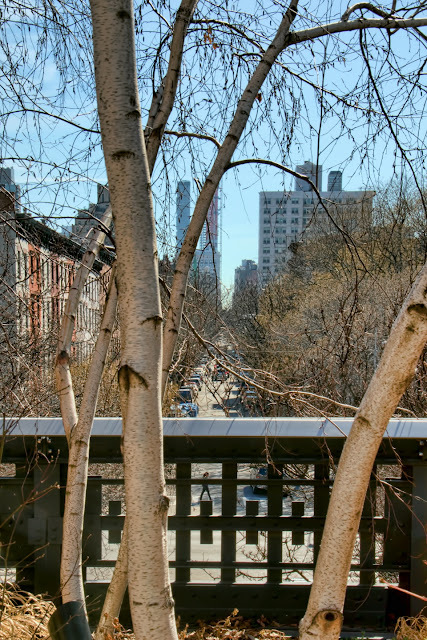 It's one of those almost-spring days when even though it's barely 40 degrees you feel as though you ought to be in shirtsleeves. 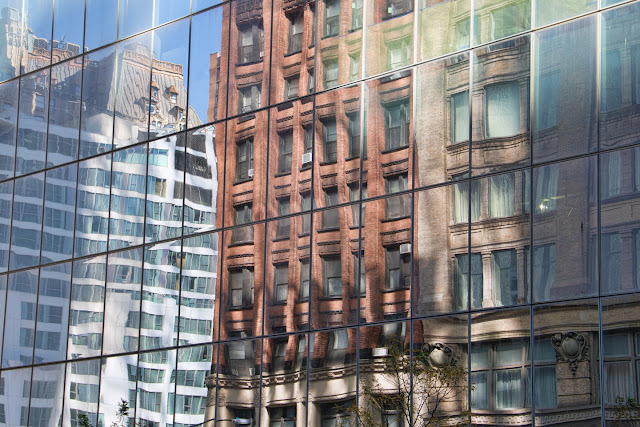 I love the way that brick building (downtown Manhattan) looks as though it's dancing in the light. Those bricks can shimmy! 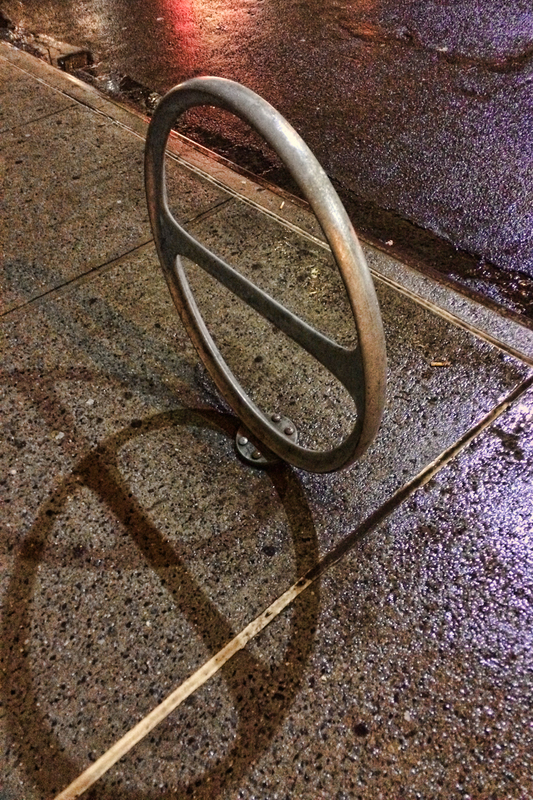 Another shot from the rainy night last week: an ordinary bike rack, glamorized by shadow and reflection. I am fairly confident that I speak for the majority of Americans when I say, "Is it November yet? Dear God, please let it be November already." I have three trips booked between now and the election -- a long trip to Australia and New Zealand in a few weeks, and short visits to Jackson Hole and Iceland later -- and I honestly cannot wait to get as far away as possible from all the noise. 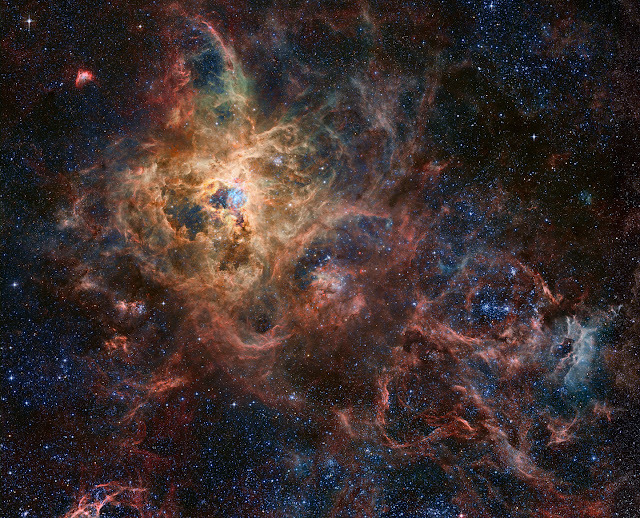 Even by galactic standards, the Tarantula Nebula is big -- more than a thousand light years across. It's the largest star-forming region in the local group of galaxies.